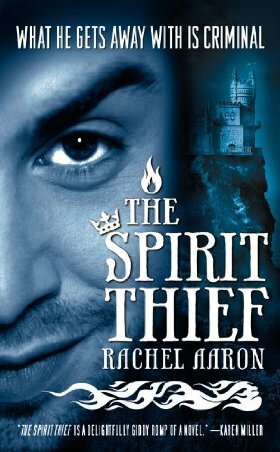 The Spirit Thief is the first book in The Legend of Eli Monpress series by Rachel Aaron. It just came out the beginning of this month, and the next two books in the series will both be out by the end of this year. The Spirit Rebellion is available now, and The Spirit Eater will be available in December. A fourth book, The Spirit War, is in progress with plans for release in 2011. The king of Mellinor is ecstatic to have captured the infamous thief and wizard Eli Monpress. After all, there are two bounties on Eli’s head for a total of twenty-five thousand gold and he could use a new arena. However, he hardly has time to figure out how to spend his all that money before he’s informed that Eli has somehow escaped. For while the king was gloating over his imminent increase in wealth, Eli convinced the door to his cell that it was not in its best interests to remain attached to the wall. During the chaos resulting from the unknown whereabouts of Eli, the wizard Miranda arrives at the castle gates. Miranda traveled to Mellinor on behalf of the Spirit Court with a warning for the king. The Spirit Court members heard that Eli had recently shown interest in Mellinor and suspect he intends to steal a dangerous artifact from the royal treasury. Unfortunately, the message comes after Eli’s plan has come to fruition, although the Spirit Court’s guess about the thief’s intentions was not entirely accurate: Eli did not want a magical item but the king himself. Miranda determines to search for Eli but soon discovers the kingdom is faced with an even greater threat than this conniving thief – and the only way to stop it may be for her to work with him to overcome it. First of all, I’ve seen a lot of posts on different blogs mentioning they got this book in the mail but don’t think they will read it because the cover makes it look like paranormal romance in disguise. That is not the case at all. This is light, sometimes humorous fantasy adventure, and there is no romance in this book, not even a romantic subplot. It seemed more like a Dungeons and Dragons campaign, albeit one set in a different place than the Dungeons and Dragons universe. It did not surprise me at all to read the interview at the end of the book and discover that the idea for the book began with a character from a D&D game- a thief whose goal in life was to increase his bounty to one million gold, which is Eli’s motivation for much of his thievery. For the first half of the book, I wasn’t quite sure how I was going to like it. Even though it had an interesting universe, it also had a fairly conventional plot and one dimensional characters. By the end, I did find that a couple of the characters had really grown on me, though, and there were also enough hints of larger developments for future installments that my curiosity is piqued. In particular, I’d like to see the ramifications of living in this world explored in greater detail and hope to see more of that in the next book. Since the next book looks like it deals more with the Spiritualists in the Spirit Court, this wish just may come true. In The Spirit Thief, everything has a spirit – even normally inanimate objects such as doors and naturally occurring objects such as trees, wind, fire, and rocks. Wizards are those humans who can actually communicate with these spirits, and the Spirit Court is a group of wizards who are spirit rights activists. Part of being a wizard is being able to control spirits, and the members of the Spirit Court believe it is unethical to force a spirit to do their bidding without that spirit’s willing consent. For this reason, the Spiritualists make mutually beneficial contracts with the spirits that serve them. There were a couple of scenes that showed the types of dilemmas living in a world in which essentially everything is alive cause, and these were some of my favorite parts of the novel. Although it may not really be fitting with the overall light tone of the novel to dwell on more serious issues too much, I am rather hoping future installments show at least a little more of the consequences of living in this sort of world. Other than the setting and magic, not much else in the book stands out as particularly unique, although it was an enjoyable story once it got going. The plot starts as a heist but soon turns into two enemies putting aside their differences for the greater good of the world (or, er, part of the world anyway). At the beginning I thought the characters were rather generic, although I did like Eli from the very beginning. (How can I resist a charismatic, competent thief as a protagonist?) As the story progressed, it made me more and more interested in the origins of his powers. In addition to being a thief, Eli is a wizard – but as is apparent from the very first scene, he’s not the same as the other wizards. He’s better able to communicate with the spirits, who are very willing to accommodate him thanks to his amazing powers of persuasion. There are some brief parts about where this power came from, but I’m definitely looking forward to learning more details about how this came about. By the end of the book, I also found Miranda had grown on me a lot. She’s obviously compassionate because she believes so strongly in doing no harm to any living spirit, but she’s also tough and admirable. If she needs to, she can put aside her qualms to do what she thinks needs to be done, and she’s also able to change her actions when she realizes she is wrong. For instance, when the librarian at Mellinor is annoying her with ill-informed questions about wizardry, Miranda’s first reaction is to snap at her. Yet Miranda quickly reminds herself it’s not her fault she doesn’t know anything. She puts herself in the young woman’s shoes, realizing she has lived her entire life in a country that hates wizards. Soon, Miranda is ashamed of herself for her treatment of the one person who seems interested in learning more about her profession, and she becomes friendlier and more informative. Other than Eli and Miranda, none of the characters were that compelling so I’m hoping they get better fleshed out in the next book. Nico, the demonseed who appears as a girl, definitely has potential, but both her character and the warrior Josef need more depth. At this time, they don’t actually seem to be more than figures with a few traits. Josef wields a huge magic sword and fights well, and Nico is freakishly strong with a dark side to her nature. The villain was also one dimensional, although at least his actions made sense with how he had been treated. The ending was well done – very exciting, and it also wrapped up the main storyline nicely while leaving the feeling that there’s more to the overall story. 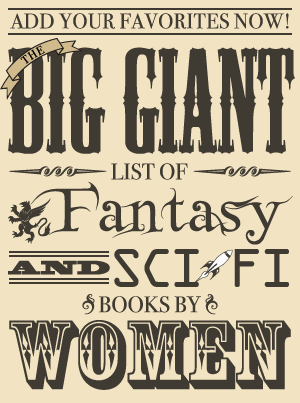 At the same time, there are also plenty of small threads left open for the next books, such as more background on some of the characters and the mysterious League of Storms that shows up a couple of times. The way some of these were included felt a little clunky since there were a couple of perspectives that just came up once or twice and seemed somewhat out of place, but at least by the conclusion it felt like setup for the next book instead of pure randomness. Even though the beginning of The Spirit Thief had me wondering whether or not I’d enjoy it, I found I had rather enjoyed it once I reached the end. It’s a fun story set in a fascinating world in which everything has a spirit, and wizardry is not spell-casting but the ability to hear these spirits. While some of the characters are rather shallowly depicted in this first installment, the charismatic Eli and dutiful Miranda are both engaging, likable characters. I’m looking forward to finding out what happens in The Spirit Rebellion.